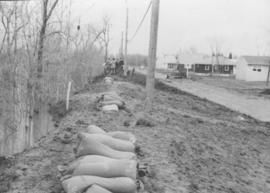 Photograph shows residential scene from 1950 flood. Stamp (on verso): City of Winnipeg - Engineering Dept., Water Works Division, Ross and Tecumseh. Description (on verso): Photo taken on April 17th, 1950, prior to flood. Note longitudinal crack along crown of sewer. Stamp (on verso): City of Winnipeg - Engineering Dept., Water Works Division, Ross and Tecumseh. - Photograph likely taken at time of 1950 flood, [1950?]. Photograph shows aerial view of Riverview district and areas affected by the 1950 flood. Stamp (on verso): City of Winnipeg - Engineering Dept., Water Works Division, Ross and Tecumseh.